Researchers and government call for new ideas to revive Indian science yet again. Will it work? THE Nobel Prize-winning research by C V Raman on scattering of photons can be used to produce scanners to study matter. But even after 80 years, India has failed to put this research to use. Reason: the country does not have the infrastructure to build such sophisticated technologies. Thousands of engineers in the country design semiconductors, but only to meet the needs of global market. India is forced to import them in absence of manufacturing facilities. The standard of science has steadily deteriorated in India in the past 20 years, say reports. Of every 100 interviews during campus recruitments, only 10 to 20 science students land a job. These tidbits of information were not pleasant to the nearly 7,000 participants— researchers and students—who enrolled for the 98th Indian Science Congress held in January in Chennai. There were hundreds of presentations on different fields of science but as the speakers pointed out time and again, most of the research will remain unused. The event did try to address the issue through many sessions dedicated to the theme, ‘Quality education and excellence in science research in Indian universities’. But the brainstorming session lacked new ideas. The recommendations are awaited. 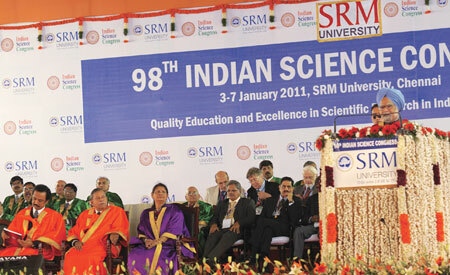 While the lack of infrastructure remained a concern, numerous discussions were held on ways to revive Indian science. Most agreed that both private and public education are crucial for improving access, equity and quality. But approaches to how these two could coexist differed. The debate leaned towards promoting the private sector. K C Pandey, president of the Indian Science Congress Association said, “It is better to look at the quality of education and not whether it is private or public.” He emphasised on collaboration with foreign institutes. His views were supported by M Ponnavaikko, provost of SRM University, a private institute. He noted “since the government does not have the money to improve education it would be better to help private institutes through public private partnerships.” SRM University hosted this year’s Congress— one of the rare occasions when a private, for-profit institute has done so. Though Kapil Sibal, Union Minister of Science and Technology too talked of public-private partnerships at the inauguration of the Congress, he was more inclined towards creation of publicfunded universities. He announced setting up of 30 new central varsities. For those institutions which perform extraordinarily well, he had a different plan—status of navratna universities. Such universities can seek external finances and would have full autonomy. This was in accordance with what the Indian National Science Academy (INSA) and the Indian Academy of Science (IAS), two of the three science academies in India suggested in their reports. “We did not take into consideration collaboration with foreign universities and privatisation in our report,” said N Mukunda, vice-president of IAS. Issue of improving access and quality of science education has been discussed before the meet. In August 2010, the Science Advisory Council to the Prime Minister discussed these issues when it prepared a road map for India to become a global leader in science. In March 2010, INSA, released vision document on science. Before this, IAS had debated the issue. The 2009 Congress too had contemplated ways for attracting the best brains to research. Both private and public institutes agreed to monitor the level of education being imparted. The National Accreditation Regulatory Authority for Higher Educational Institutions Bill 2010 is already in Parliament. There is also a plan to set up a National Commission for Higher Education and Research, Sibal said.